How to add text to a map? I would like to add "custom text" labels to a map view, but I can only find pre-defined images. How can I create a map object that shows a custom textbox? 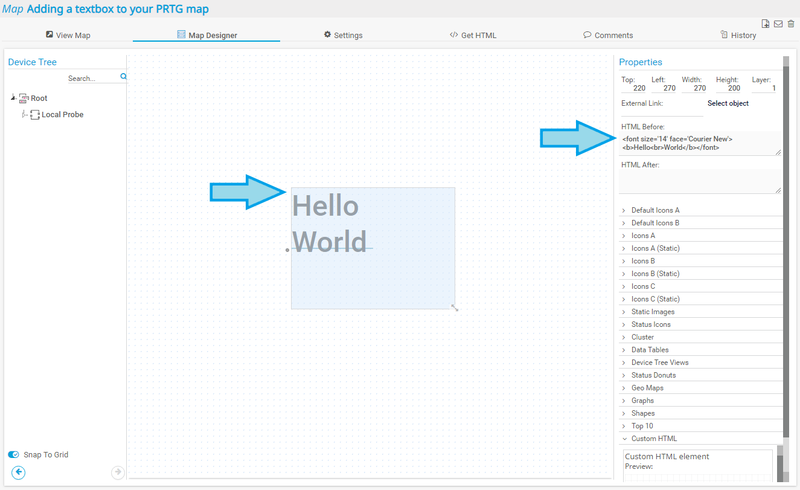 You can add a simple textbox to your PRTG Map using a Custom HTML element. With this method, you are able to style your text the way you want. The article shows you all necessary steps to create your custom textbox. Open an existing map or create a new one. In section Properties on the right side of the designer window, look for Custom HTML at the end of the list and expand it. 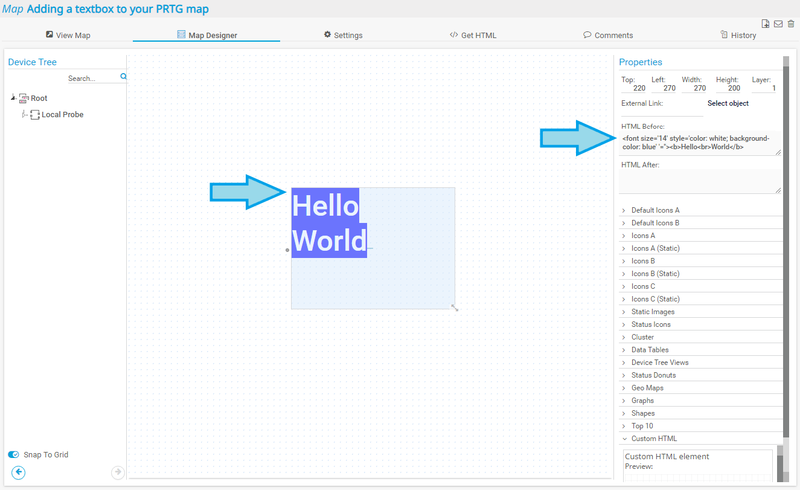 Choose Custom HTML Element and drag and drop it on your map. Click the added element so it is highlighted. You will now see available options for this element under Properties. Enter your text in HTML format into the HTML Before field. Well done! Now let's get more advanced and edit the text, add formats, and add some color to the text, for example. You can use any HTML to show text in your desired style, for example, bold format, font size, and color. Perfect! But perhaps it would look better in the Courier New font. So, let's change your font! Perfect! But perhaps it would look better in bold format. So, let's change the text to bold! Great! But perhaps it would look better with a line break. So, let's add a line break! Because PRTG uses standard HTML code to insert and edit text in maps, you have many options to adjust the text to your needs and to the design of your PRTG map. 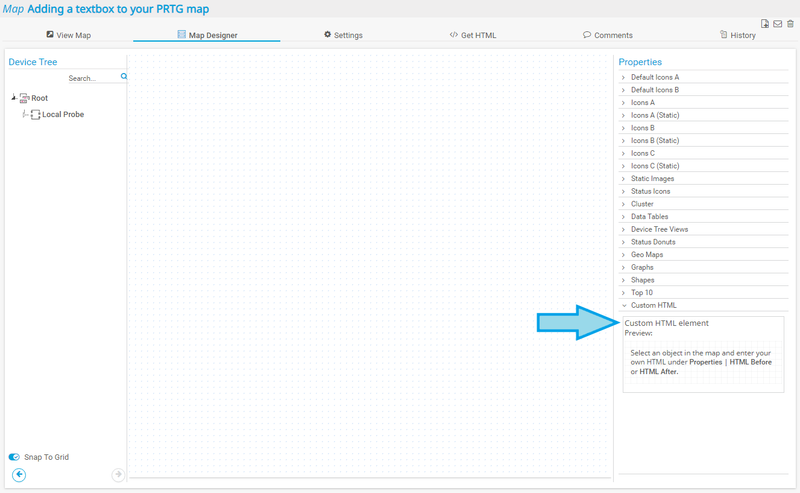 So, start creating your individual dashboards with PRTG! Use the Custom HTML Object Type. For more information, please see PRTG Manual: Maps Designer and look for Custom HTML. That means using HTML code, and only possible to first have to create images with text, save and than link via HTML. Where to store those images, so they are easily to integrate, eg relative link to PRTG. I was hoping for a a solution to add "free" to define on the fly text labels. For instance to name indicated areas on the map. there is no need for images! and enter the html code. The example in the manual with the link to include an image is just an example! There should really be a "Text Box" object. Having to add custom HTML for text labels is overly complicated for such a simple and necessary task. When I try to use the custom HTML option I cannot enter text or edit in any way. I am an admin in PRTG. I have tried placing the object in the map, but still cannot edit. Any ideas what I'm not doing right? now enter your text in the HTML Before field and save. now you should see the text in the Custom HTML Element on your map. Really very complicated ! I just need to create a rectangle with a text like a room number so thet the helpdesk can if a location is down. But there are only non-transparent rectangles in the object section in map designer. Any idea how to get it transparent ? adding a simple text box to the map is already on our wish list, as well are transparent elements. Agreed, i'm also hoping for a simple text box object. 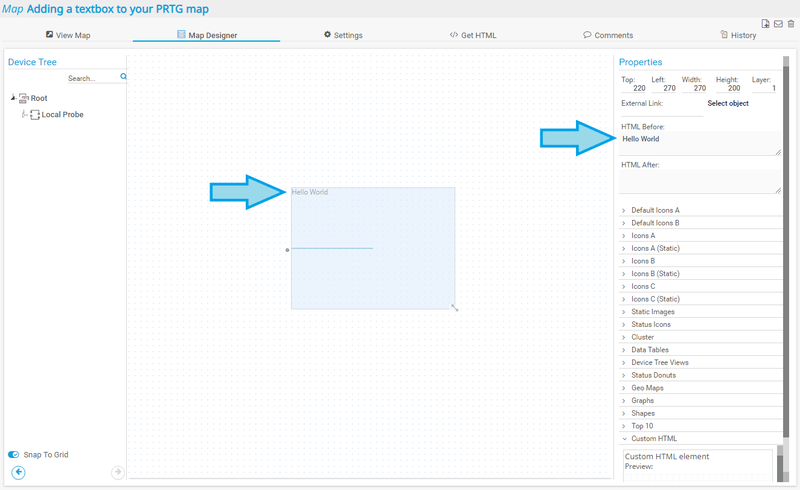 What is so difficult about adding the custom map object to the map and simply entering the text in the HMTL Before box (no tags necessary for plain text)? A dedicated text object would not be different. Really PRTG team? HTML box is totally different thing. For instance I want to add random labels in random places on my map. I don't want to use some object for that, because I can't make it invisible. 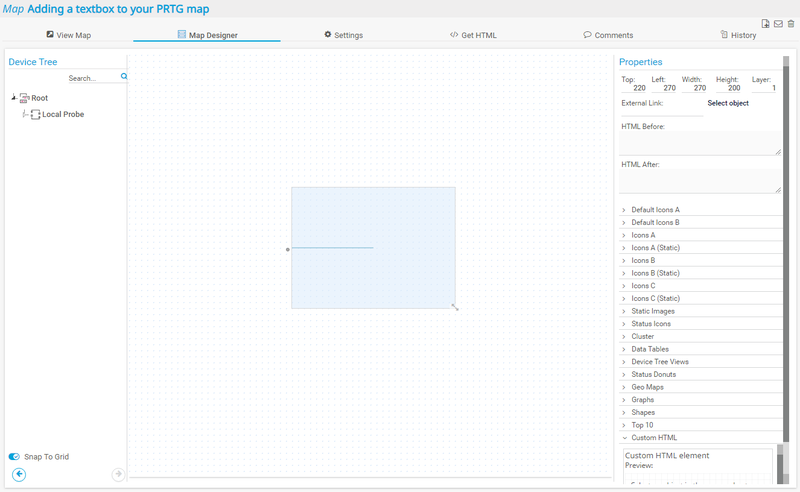 As anything on a PRTG map is an object. 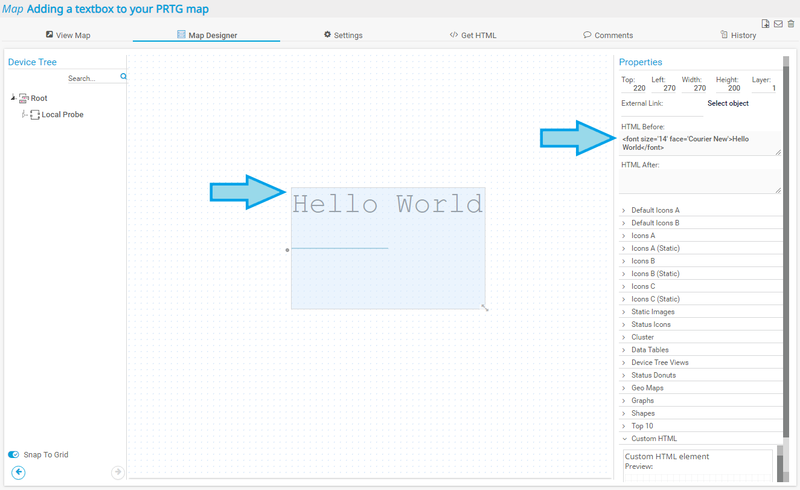 Entering custom text is only possible using a map object as well. You can use the otherwise empty "Custom HTML / Custom HTML Element" for this. How to add simple Text Labels to a Map? Not a "Custom HTML" - that´s to complicated for customer. Customer said 5 minutes ago "simply like text box like in visio"
I think this should be possible to enable within 4 weeks, rollout with next update and all user would be very happy! We agree, the usage of the Custom HTML Element (at the bottom of the object list) is a rather complex solution for a text box. However one can enter text this way, we try to avoid redundancy. One of the reasons we don't want to implement enter a label object at this time is that this would require some options for text size, bold font and so on. We would have to implement several different pre-configured label objects, or implement an option box. With the HTML input this can be avoided as the user can format using HTML. A label object would require a text input field. That would be redundant since there is HTML Before/After.